JD.com aims to perfect its technology and, in competition with Amazon and Alibaba, eventually sell its system to businesses that want to shrink their labor costs. SHANGHAI — Inside a warehouse the size of seven football fields, hundreds of robots pack roughly 200,000 boxes each day and ship them to customers across China. Four humans baby-sit. One is Zou Rui, 25, a soft-spoken engineer who stands for much of his eight-hour shift in New Balance sneakers, monitoring a milky-white mechanical arm. It plunges up and down like a pecking chicken, grabbing parcels with a suction-cupped hand and dropping them into containers on a conveyor belt. If something looks odd, Zou rushes to fix it. Otherwise, he said, he jots notes in a binder, tracking the arm’s performance for his remote bosses. Or he chats online with his colleagues: two men and a woman, all about his age. Here, Zou is far from his family’s cornfields in the eastern province of Anhui, far from the bustle of his old workspace with 100 or so people. But he doesn’t feel isolated. 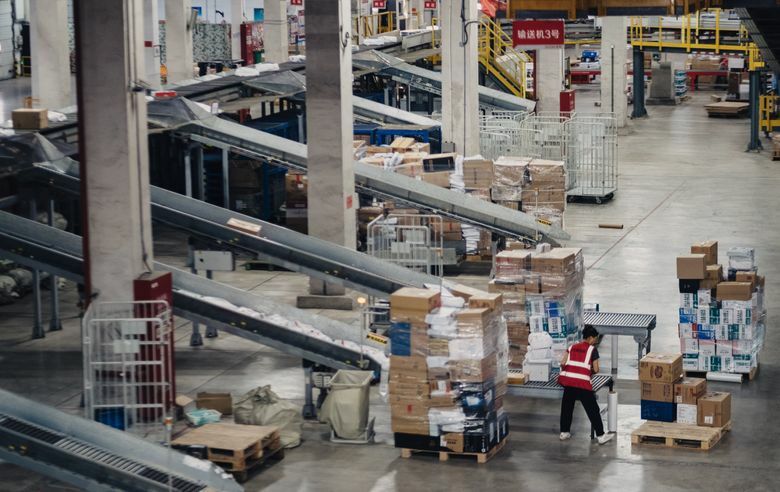 Zou works for the Chinese e-commerce giant JD.com, which lauds this warehouse on the outskirts of Shanghai as one of most automated in the world. Analysts say it’s a peek at the future of manual work in China and beyond — a place where a chosen few tend to the machines, while most workers have been rendered obsolete. Thanks to a “strategic partnership” with Google, that future could be coming soon to the United States. But chief executive Richard Liu wants to take the high-tech concept even further in a country once known as a hub for cheap labor. His facility near Shanghai serves as a learning lab for the company — which reported a slim $18 million in profit this past year on revenue of $55.7 billion. Executives hope it will prove to be a not-so-secret weapon against competitors Alibaba and Amazon, which are also racing to develop the next generation of e-commerce super machines. JD aims to perfect its technology, spread it to the firm’s 500-plus other warehouses across China, Thailand and Indonesia, which still depend on thousands of people, and eventually sell the system to businesses that want to shrink their labor costs. As of today, JD employs roughly 160,000 full-time workers in Asia. Over the next decade, Liu said, he hopes to see that number dwindle to “less than 8,000” better-paid staffers who work two or three hours daily. The jobs would be “easier, more fun and less dangerous,” the company head said this spring. JD signed its deal with Google in June, and Google announced plans to invest $550 million in the firm. “This marks an important step in the process of modernizing global retail,” JD’s chief strategy officer, Jianwen Liao, said at the time. JD also opened its first Chinese grocery store this year with Walmart. Shoppers there can pay with their smartphones. The partnership with Google is expected to boost Google Shopping, a search engine for goods, and intensify the U.S. company’s domestic rivalry with Amazon, which has deployed more than 100,000 robots of its own around the globe. In the warehouse where Zou works, machines guided by image scanners handle all the goods, largely cellphones and cameras and other rectangular-shaped electronics. Packages travel along a highway of belts. Mechanical arms stationed throughout the network place the items on the right tracks, wrap them in plastic or cardboard and set them onto motorized pucks dubbed “little red men” — a nickname inspired by the spunky creatures in the Minions films. The little red men carry the parcels across a floor that resembles a giant checkerboard and plunk them down chutes to sacks. Computerized shelves on wheels retrieve the loads and transport them to trucks, which deliver most orders within 24 hours of a shopper’s click. While people still outperform robots on a range of tasks — lifting objects of various shapes and sizes, for example — economists predict that JD and other e-commerce businesses are leading a shift that will displace millions of workers worldwide in retail and manufacturing. A swath of jobs that follow patterns will vanish, Ford said — the global consultancy McKinsey predicts that robots could replace almost a third of the American workforce by 2030 — and a new crop of highly skilled positions will emerge. Peter Yu, chief technology officer of XYZ Robotics, a startup that focuses on supply-chain automation, said workers shouldn’t fear the change. Automation, he said, will swap boring jobs for better-paying and more stimulating work. The United States’ estimated 908,000 warehouse employees (who don’t all work in e-commerce) hardly socialize anyway, Yu said. At JD, Cheng Hui, head of robotics research for the firm in San Francisco, said market forces propel the scramble to automate. China is grappling with a labor shortage, he said. The country’s one-child policy, which was in place from 1979 to 2016, shaved down today’s number of young job seekers, giving workers more leverage to ask for higher pay and better benefits. Government officials have admitted the policy stifled population growth, making it tougher and more expensive for companies to fill vacancies. Yao Meixiong, deputy director of the census with the Fujian Provincial Bureau of Statistics, has estimated that China’s young workforce (20 to 34) in 2030 would total 221 million, down 104 million from 2010. For Zou, landing a job at JD’s first fully automated warehouse felt like a promotion. “The robots reduce the jobs that are boring,” Zou said. He doesn’t share the fear that machines will take over. After all, he said, his role didn’t exist a little more than a year ago. Zou remembers making his first online purchase as a teenager: a custom-made basketball jersey. “This is the future,” he thought, and it seemed more interesting than selling corn with his parents. He went to business school near his hometown, but higher education didn’t prepare him for the specifics of the JD job. Zou completes a training course every two months — the technology evolves that quickly.